I suppose a blog was inevitable. I enjoy posting to my Homeschool News Facebook page, but sometimes I have wanted to write more than what works for that medium. I want to be able to write about things that might help other parents. Now. A blog seems like a perfect solution! It seems like just yesterday that I was writing about my young homeschooler, and now I’m the mom of two adults, as this photo of the three of us reminds me! David was homeschooled until college. He will soon graduate with an AS degree and is waiting for responses to his university applications. 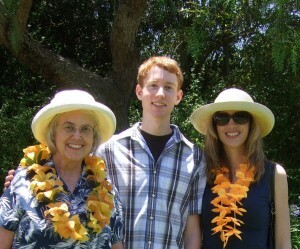 [May 2012 update – he was accepted at 4 UC campuses, and chose Berkeley.] He’s a biology major, with an interest in neuroscience. He works as an after school math tutor at a public high school, which shows that little homeschoolers who don’t want to study math can grow up to be quite good at it when the time is right for them to learn! David designed and maintains this Cedar Life Academy website. Kristen was my awesome assistant for the 6 years that I coordinated the CHN Family Expo, and many homeschoolers who attended the conference during those years met her. She moved to the SF Bay Area a few years ago and loves it there. She is very busy teaching music and directing, and some of her students are homeschooled! David designed her website too: www.kristentaylormusic.com. If you have a music question, perhaps she can help you! I still remember the early homeschooling years and the worries, and I love encouraging and supporting parents. Homeschooling was a wonderful experience for our family, and I’m so glad we chose this educational option – yes, we parents do have an option and can decide what is best for our children! Another update! David graduated from UC Berkeley and is a grad student at UCSF, studying neuroscience. Kristen works with me, helping CLA families! Written by Karen Taylor, posted on 20 March 2012 at 5:30 pm, and filed under CLA Info. Bookmark the permalink.